Orange County and the Central Florida Commission on Homelessness hosted the first-ever Central Florida Landlord Summit with other community partners on July 29 to address homelessness and help individuals, families and children find safe, stable and affordable housing in the region. 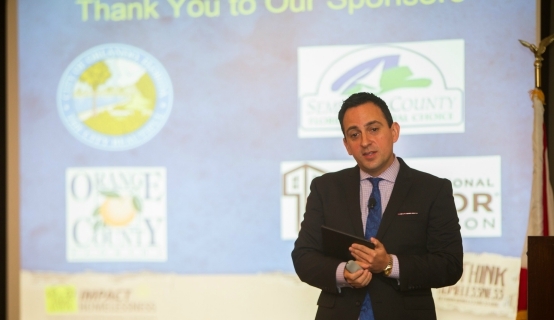 The event was attended by almost 200 landlords and community leaders from Osceola, Orange and Seminole counties. “Building upon the great momentum and recent, renewed awareness that has been created regarding the issue of homelessness, I believe that we can make history by transforming the lives of our homeless children and families, the chronically homeless and our proud Veterans,” Mayor Jacobs said. The Summit focused on the recent influx of funding and support that will soon be available for landlords, property owners, and individuals who are interested in partnering with the community to significantly reduce homelessness in Central Florida. “These people deserve our help and not our judgement,” said Andrae Bailey, CEO of the Central Florida Commission on Homelessness at the event. An overview on “The Plan to House 100,” a widely-supported regional plan that is based on the Housing First and Rapid Rehousing models – both of which have proven to be very effective in reducing homelessness in communities across the nation – was discussed at the Landlord Summit. The Plan to House 100 includes public and private funding and improved processes to significantly reduce risk, and improve outcomes for all participants. This plan also includes access to financial resources to protect property owners should a tenant damage a unit beyond the security deposit; fall behind in rent; or break the lease prematurely. The plan also aims to dramatically increase access to housing for homeless families with children, and supports Orange County’s commitment to effectively end Veterans homelessness. A collection of photos from the Central Florida Landlord Summit is available for use by the media and are located on Flickr.